The Formal "How do you do?" 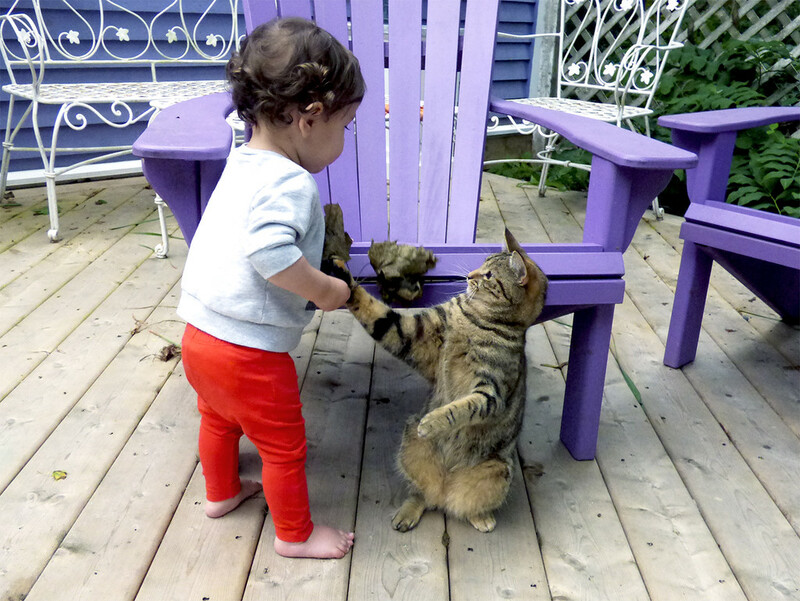 This kitty that we named "Dinah" *adores* playing with the kids! She hides under bushes and ambushes the boys to their squeals and laughter and they run and she dashes across the yard past them to hide under another plant! Here, Hazel picked up a spray of crisp leaves, and Dinah couldn't wait to play with them! This cat's wonderfully animated and a delight to photograph! The Chicago clan flew home this afternoon and will be greatly missed! Everyone has given the vacation together our highest marks! There's no shortage of good memories! This is too cute for words. This grandmother rates it a fav for sure! oh my gosh perfect timing!!!!!! Oh my gosh! How precious is that? Triple Fav Louise! @chard One in the same! @joysfocus @mzzhope @allie912 Thank you for making this a fave! This kitty is adorable and playful & amazingly I have several similar pictures like this with others in the family! I love that you love her, too! how sweet is this picture? love it. Oh what a gorgeous cat and such a sweet capture! Glad you had a great time with your family! Lovely that you are able to all get together like that it must be wonderful for you! Fav for such a lovely shot which made me smile! I adore this photograph. How fun to be able to capture these moments with your grandchildren. that is so cute! great cat. LOL, that is priceless. They are both looking quite huggable. It is great to watch how the little ones interact with the animals. What a fab capture - congrats on TP. Very well deserved. Wonderful interaction, it's nice to see a cat so friendly. Wow, it sure looks like Dinah is shaking Hazels hand. Amazing picture! So great to hear you've had a memorable time with your Chicago clan. Awesome! I love cats! This one obviously adores the kids! The cat is well brought up. A great lovely and funny capture. awesome. I'm sorry that your family is gone! Louise, this is such an adorable photo. This is just too cute and the cat looks almost a big as the baby!!! LOL Love this!! FAV! How could I possibly not LOVE and FAV this?!! Dinah is delightful, and so is Hazel (she belongs to the Chicago clan, right?!! Thank you so much for the email with the clarification, sorry for the lack of response, but you know how it goes, and I figured I would give both of us time for the dust to settle down! )....Now, one thing I have noticed is that you have mentioned nothing about Dinah's owners! It sounds like she has adopted you, and is also keeping Fred away.....where is Fred?!! Thank you for the faves! I'm so glad I captured this moment, as that cat just loved the kids (and now, though still coming around, seems to be looking for them around the house!) Thanks for liking this one! @shazzym @dianen @kingstonroadcreative Your faves for this photo are most appreciated. As I was fortunate to capture this moment with my grand daughter and Dinah, it was a delight to share it with the community and have it well-received! Thank you all for finding this photo to be fav-worthy! It was such fun to have all my grandkids here together for a couple of weeks, and of course have many many photos of them. I tried to share only the ones I thought might be most enjoyed by this community, so again, thank you for liking this as I'd hoped you might! @kingstonroadcreative Thank you so much! I'm delighted you like it! Love the colors and most deff, the subjects! So stinkin cure! Far too cute! This is lovely. Such a sweet candid, with lovely colors and composition. I've never seen a cat sit up like that and shake hands. Ha, ha, she must think she's a dog.